Information on Wathen’s is tough to come by. If you go to the spirit’s website, a notice reads, “New Website Coming…01/01/10.” I guess they’re behind on their marketing efforts. But many bourbon enthusiasts would call Wathen’s anything but behind in terms of crafting a quality spirit. Reviews across the web are very favorable for this bourbon that was 8 generations and 250 years in the making. I picked up a 750 ml. 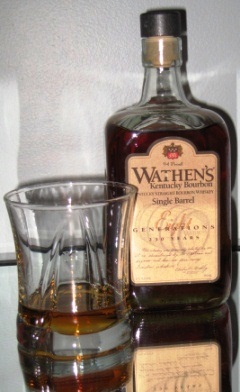 bottle of Wathen’s (94 proof) for just shy of $30. I was attracted to its deep orange color, stout bottle, and classic-looking label. A sticker across the top denotes the barrel number and the date my sample was bottled: September 30, 2010. In the glass, Wathen’s has more of a yellowish tinge. While the nose is very faint at first, a deep breath summons a warm aroma of dark cherry, brown sugar, raisin, and vanilla. I liken the smell to the taste of white chocolate-covered raisins. Unique and tempting. Like the nose, the spirit’s flavor has a way of slowly creeping up on you. At first taste there’s hardly any spice—just a honey sweetness with some buttery texture. Then, after a second or two, the wonderful finish kicks in. Here you’ll find plenty of spice offset by oak, banana, and licorice. Fortunately, this finish lingers long enough to enjoy it, study it, reach for your cigar, and take a slow puff to see how the two complement each other. I haven’t found a cigar that pairs poorly with Wathen’s, but the best seem to be in the mild- to medium-bodied range. No surprise there, especially since this bourbon isn’t the stiffest pour on the market. So far the Coronado by La Flor, E.P. Carrillo New Wave Connecticut, J. Fuego Origen, and Tesa Vintage Especial have been the top performers. I look forward to experimenting further to see what other pairings I can unearth.